I’ve just returned home from 10 days exploring a 1000 kilometre gravel road tour through a rural Thailand that is worlds away from the nation’s popular image of party and beach life. But the topic of what Thailand is really like away from the very small part of the country most visitors see is for later. For now, as I am unpacking my bike, I thought it may be of interest to anyone planning a tour through South East Asia to see just what is necessary to take along. It should be said that it is hot and dry at the moment, meaning warm clothes are totally unnecessary, and a waterproof jacket could happily be left behind. If I were riding in the north of Thailand in wintertime I would add a layer of merino wool, a wind stopper gilet, and a light down gilet. If heading beyond Thailand, to Lao, Burma, or Cambodia for example, I would probably include a small bottle of brake fluid and a bleed hose, not that I have ever needed it, but for peace of mind. Oh, and tucked inside my handlebars is always a gear cable. But otherwise, the info detailed here should cover you for touring Southeast Asia by bicycle. Back home from one thousand kilometres of gravel road bike-packing. Just before unloading the machine the Kinesis ATR fully loaded tipped the scales at 15KG all in with empty water bottles. The top-tube (gas tank) bag is for fast access high-calorie food on the go - M&Ms, Haribo gummy bears, jelly-babies, that sort of thing. This old Alpkit seat pack has served me well for many years and contains the bulk of my gear when on the road. Seat pack size comparison with tatty old Chrome SPD shoe. At times a stiffer sole would be nice on long climbs, but overall this is an ideal bike packing shoe as walking is comfortable meaning no other footwear is needed. Titanium mug and immersion water boiler. Handy tip: Keep your mug in your bag. No idea why carrying the mug on the outside of the bag seems to be in vogue, seems rather impractical if going somewhere dusty muddy or wet I.E. on an adventure). I carry my own soap as I very much dislike using throwaway plastic bottles of soap in guesthouses. The soap serves as shaving cream. Tiger balms can be used as insect repellent. I see no need for more clothes in this hot climate, in fact carrying 2 shirts was a bit of an indulgence, after all, one can only wear one at a time. Give your daytime riding kit a quick wash in the sink each night and all is well. This Revelate Designs frame bag is new (thanks Wally) and I am very pleased with it. I find the squarer shape far more useful than my old Alpkit frame bag. Haribos and M&Ms live in the top tube bag. Spare spokes, chain lube, tyre sealant, and a small piece of rag live in the frame bag. The Blackburn Wayside multitool covers most eventualities, click here for a good review. The Leatherman Skeletool features pliers, knife, screwdrivers, and bottle opener. The little silver capsule is a tubeless puncture repair kit by Dynaplug, expensive but a well thought through piece of kit. A good review can be seen here. And finally a small backpack. I use an Evoc CC10 which I find remarkably comfortable, well made, and well organised. It holds my iPad (PaintedRoads mobile office), passport etc, charger, iPhone and USB cables, small power bank, pressure gauge, and spectacles. On the left shoulder strap is an iPhone pouch which allows quick access for navigation purposes. Depending on the journey I sometimes use a 2-litre water bladder, particularly useful on gravel road journeys when water supplies may be further apart, and water bottle quickly becomes coated in dust. 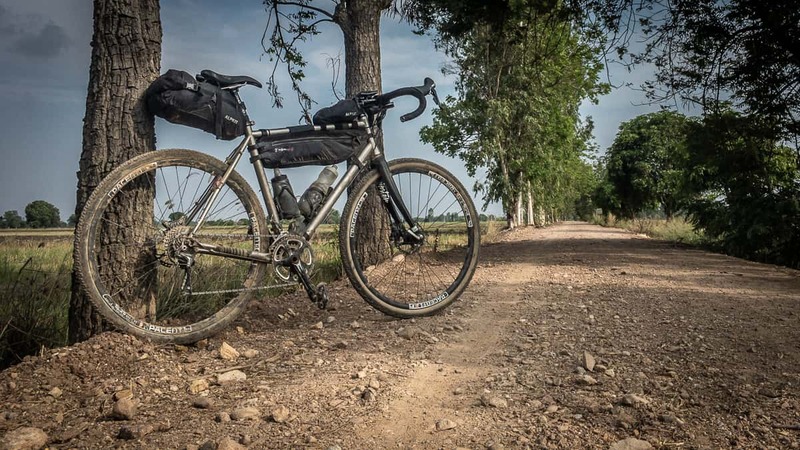 The only other items carried are a spare inner tube in the V just above the bottom bracket, two water bottles, a GPS unit, and a pump - a SILLCA Tattico as you ask, which to date I feel is the finest pump I have ever tried.